Thursday, April 4th: 6:30 p.m. – 8:30 p.m.
As we enter a new age of socially conscious business, the question has more answers than ever—with a whole world of possible career paths. 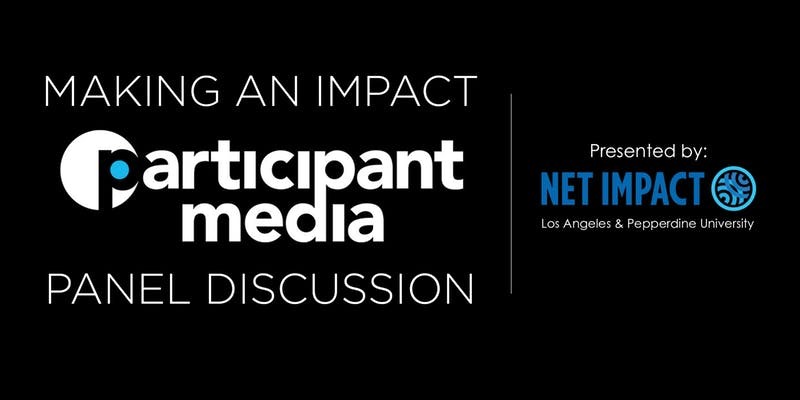 Net Impact LA and Net Impact Pepperdine are proud to partner with the one and only Participant Media for an inside look at the world of impact. In over 80 films and thousands of hours of programming, this Oscar-winning media company has shined a spotlight on some of the biggest forces for good in our times—not to mention media, itself. The evening will begin with a tour of the Participant Media offices, followed by a panel discussion and Q&A with leading employees from the company. Topics will span everything from careers in impact to B Corp Certification, and include perspectives from professionals in HR, marketing, partnerships, business, strategy, and legal.